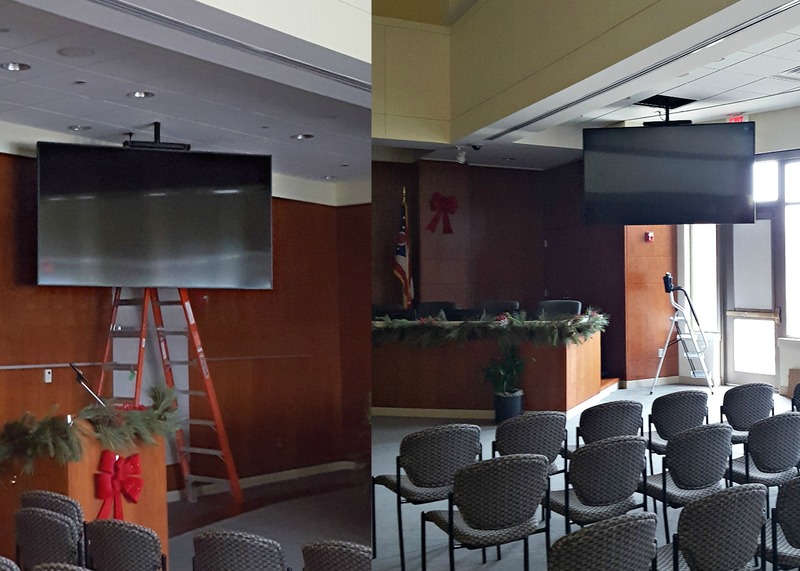 June 28, 2016 August 23, 2016 | Polar Focus, Inc.
Scott Tomashek from Camera Corner Connecting Point and his crew did a great job installing this sound and video system in an insurance company presentation space in Wisconsin. 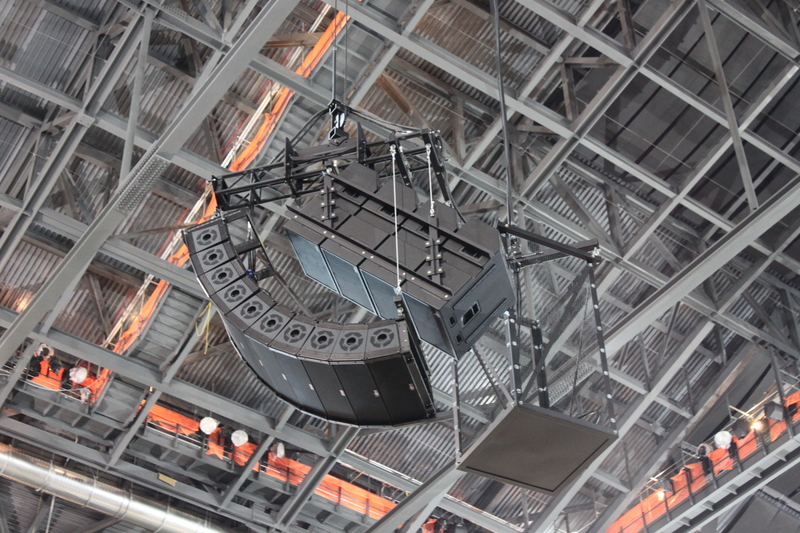 This system includes five curved video screens that raise and lower on a winching system, and 11 Danley Sound Labs, Inc. speakers. There were five pairs of SH69 Danleys, each with independent pan and tilt. 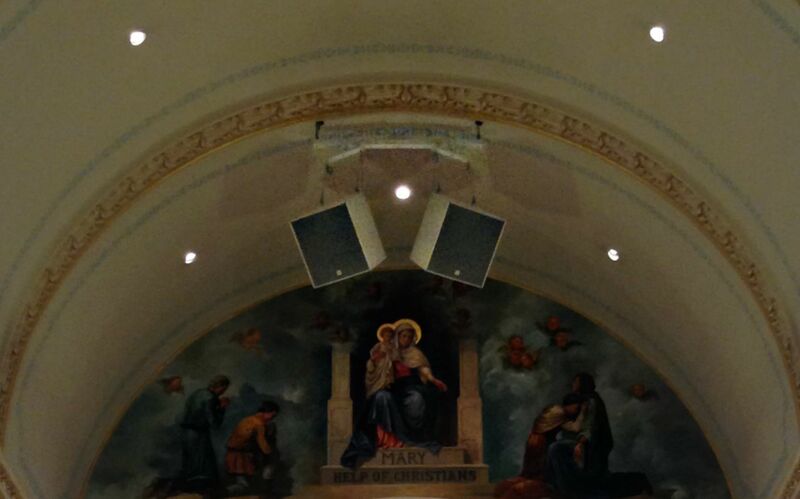 The lower speaker within each grouping also had separate tilt adjustment, for precision coverage control. 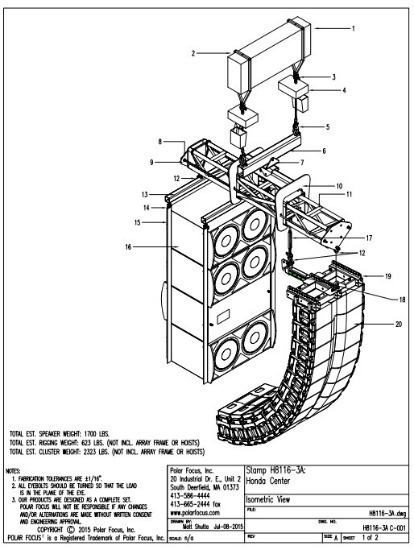 At the center is a 500 pound BC415 subwoofer for terrific low frequency coverage. 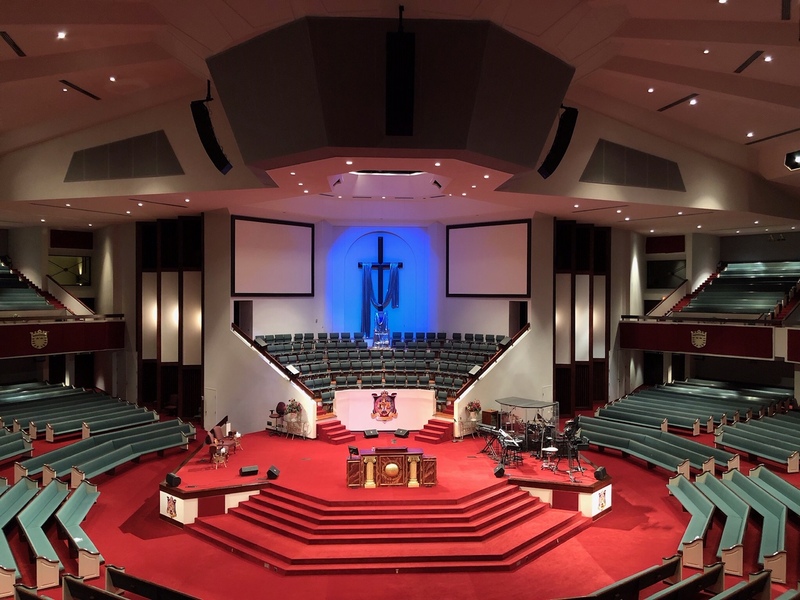 Polar Focus provided roof attachment, pan and tilt adjustment for each pair of speakers, custom grouping plates to create clusters as pairs, and custom rigging to plant the subwoofer exactly in the middle. The end result was beautiful and sounded great too. Excellent work Scott and the guys at Camera Corner! 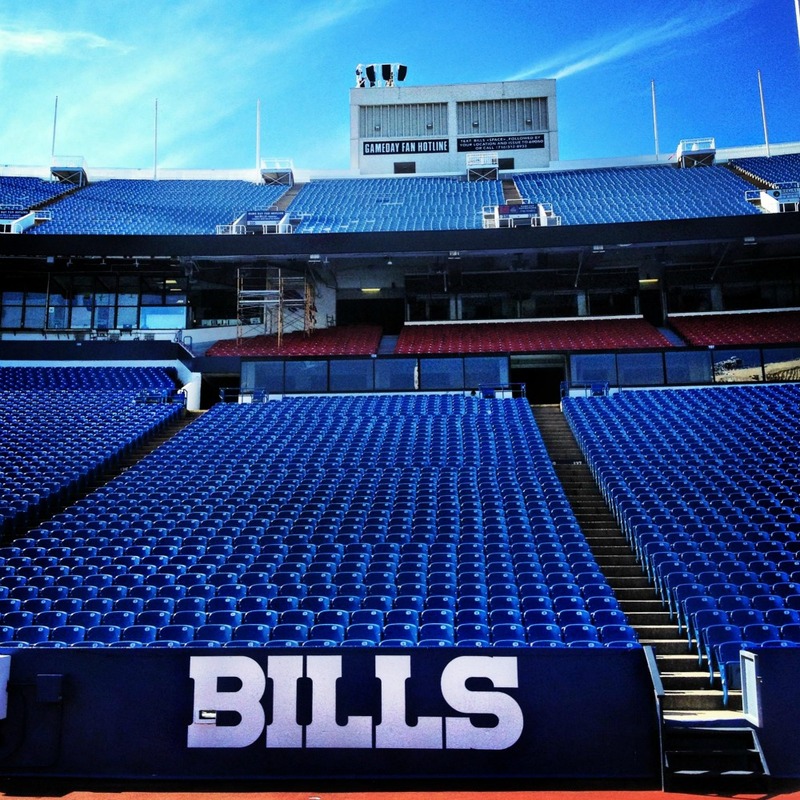 Image | November 5, 2015 March 29, 2016 | Polar Focus, Inc.
Polar Focus collaborated with Ronco Specialized Systems on this beautiful custom weatherized frame system for Danley Sound Labs speaker clusters at Buffalo Bills (aka Ralph Wilson) Stadium in Orchard Park, New York. 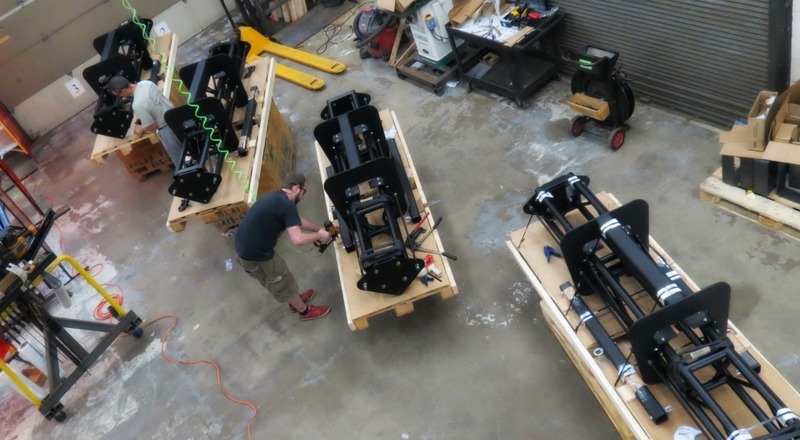 Each of the four clusters were lifted up complete (with speakers installed) on a crane and installed onto support columns built to support the Polar Focus frame system. Check out the view of Lake Erie and the wind turbines in the distance. 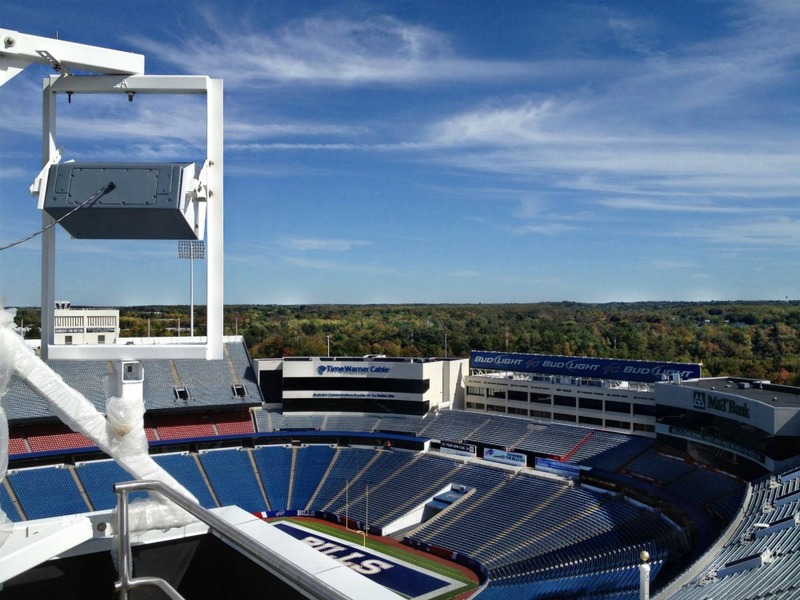 The complete framing system was galvanized to withstand harsh Buffalo winters, then powder coated in UV resistant white to match the towers. 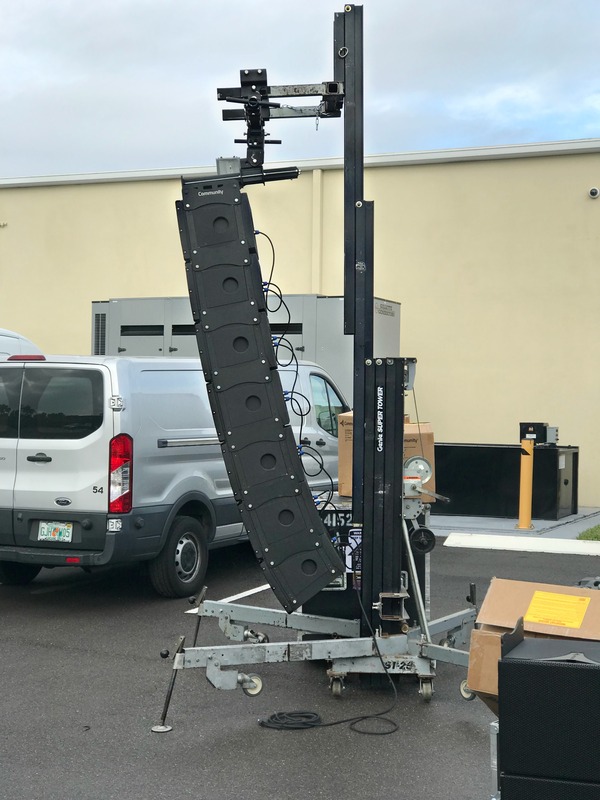 Each of the four clusters consists of three Danley GH-60 Genesis Horns, a Danley SH-95 for center fill, four Danley SH-MINIs for fill right below the cluster, and two Danley TH-118 subwoofers. The Buffalo area gets some serious weather and wind from Lake Erie. 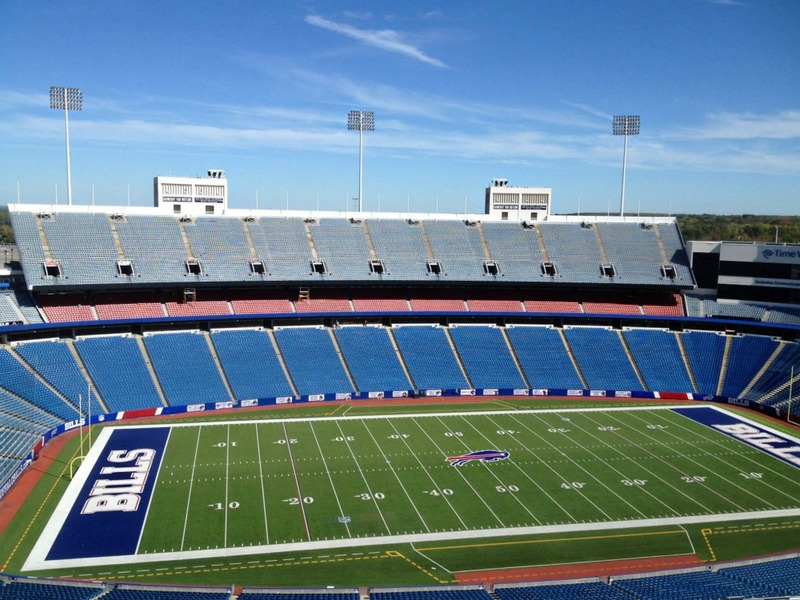 Many of the old loudspeakers at Ralph Wilson Stadium had been destroyed from weather exposure after 10 years. 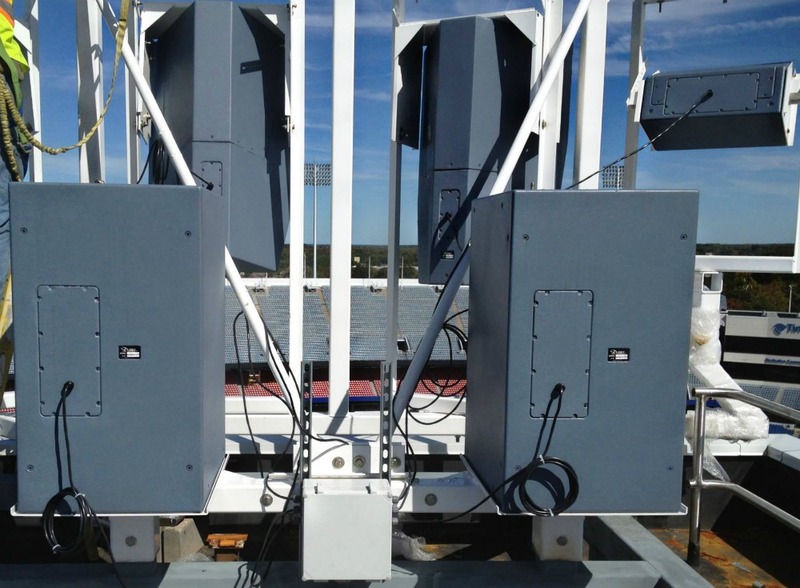 If you look closely, you can see the four Danley SH-Micros, installed on each tower to provide under-balcony coverage. 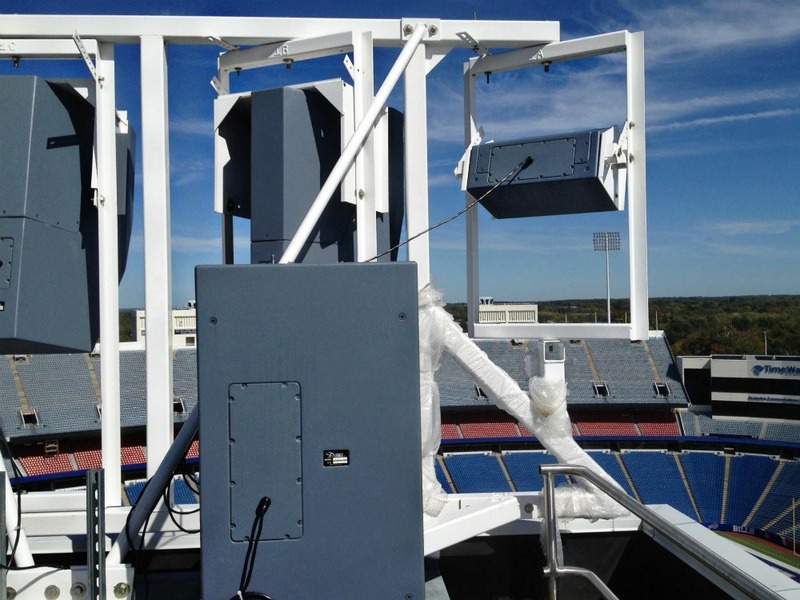 The Danley loudspeakers provide excellent coverage for this wind and weather challenged stadium. 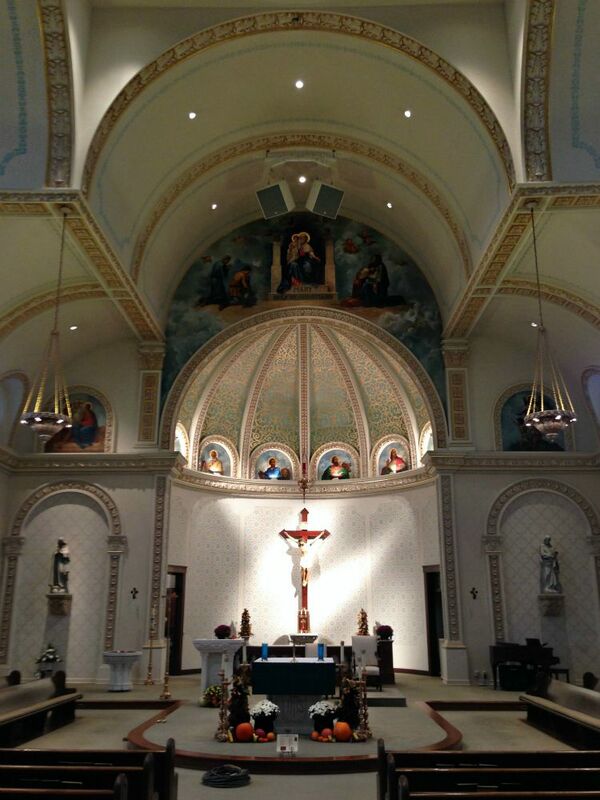 Photos used courtesy of Danley Sound Labs and Ronco Specialized Systems. August 18, 2015 January 27, 2016 | Polar Focus, Inc.
in collaboration with Michael Tylinski at Commercial Sound Resources in Toledo, Ohio. Electro-Voice EVH-1152-D-66 flown with Polar Focus Zbeam. 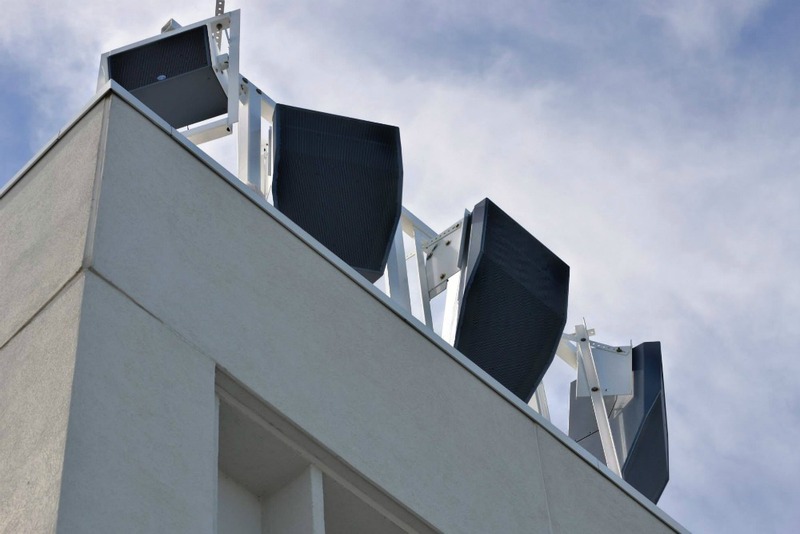 Shown is a cluster of two Electro-Voice EVH-1152-D-66 loudspeakers, each suspended by a custom spreader and a 20″ white Zbeam half. Polar Focus Tilt Cable Kit provides tilt control for the speakers. The entire cluster is raised and lowered with a previously installed cable winch system. The EV loudspeakers in white give clean, polished look to the installation and blend in nicely with the decorative ceiling. Polar Focus, Inc. is your source for a full line of audio rigging equipment. Our standard 10:1 design factor provides the high level of safety and peace of mind required by our customers. 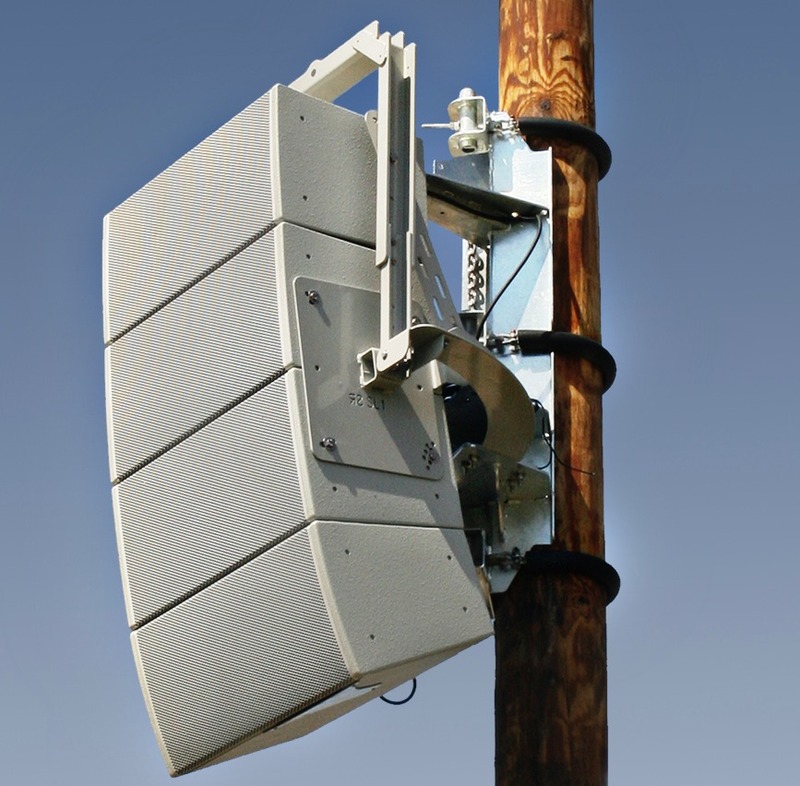 Call us today if you need help rigging, mounting, or aiming your loudspeakers or line arrays. 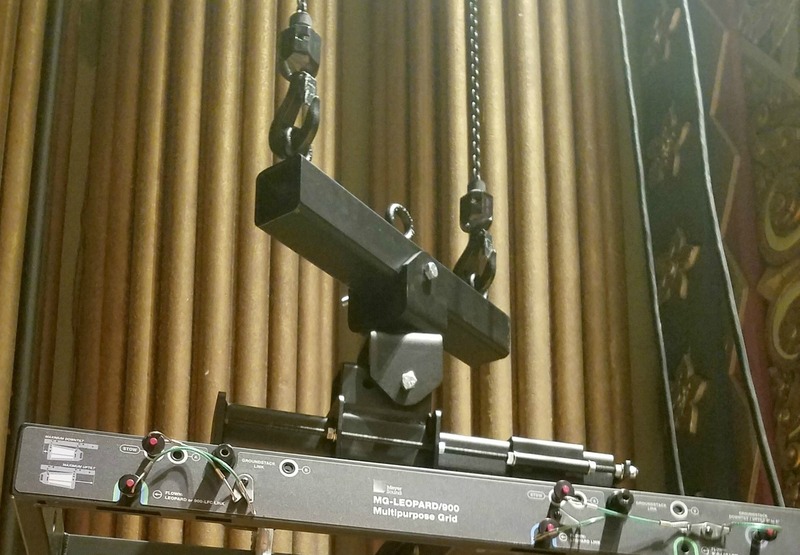 Our Audio Rigging Consultants can be reached at (413) 586-4444. 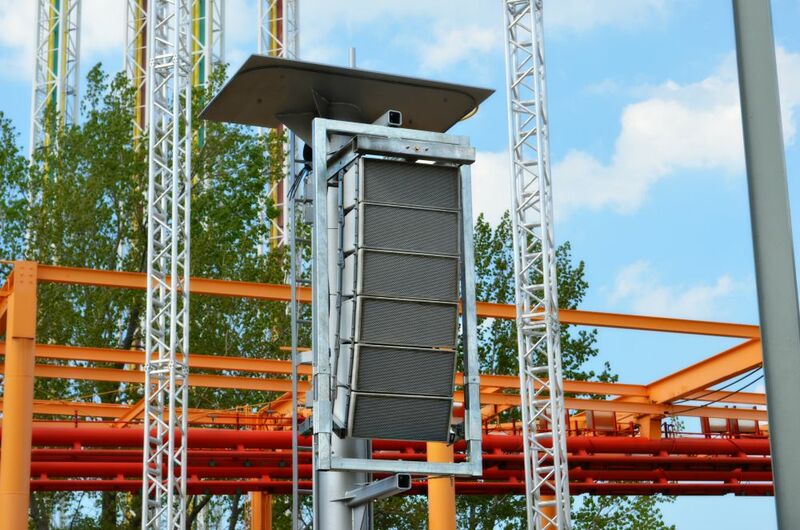 Image | August 6, 2015 March 30, 2016 | Polar Focus, Inc.
Polar Focus provided custom designed weatherized frames for this six-box array of QSC Audio Products Wideline Series WL2102-wx installed at Cedar Point Amusement Park in Sandusky, Ohio. 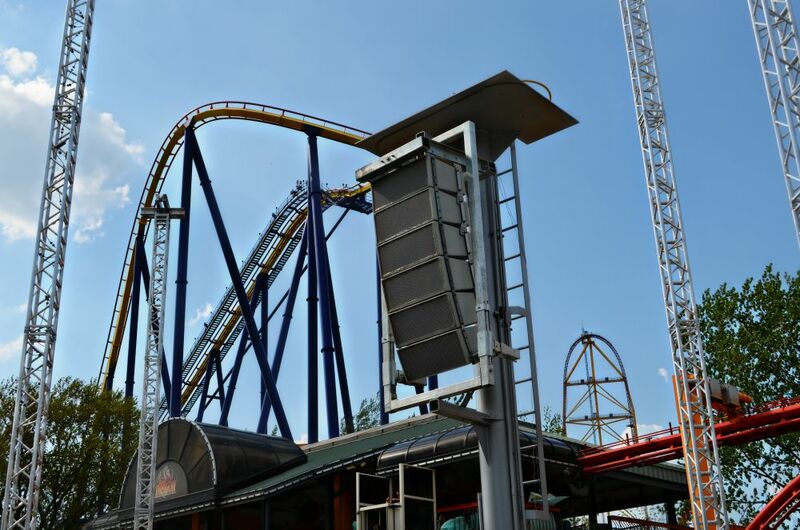 These line arrays are ready for some serious weather, as they are left in place year round. 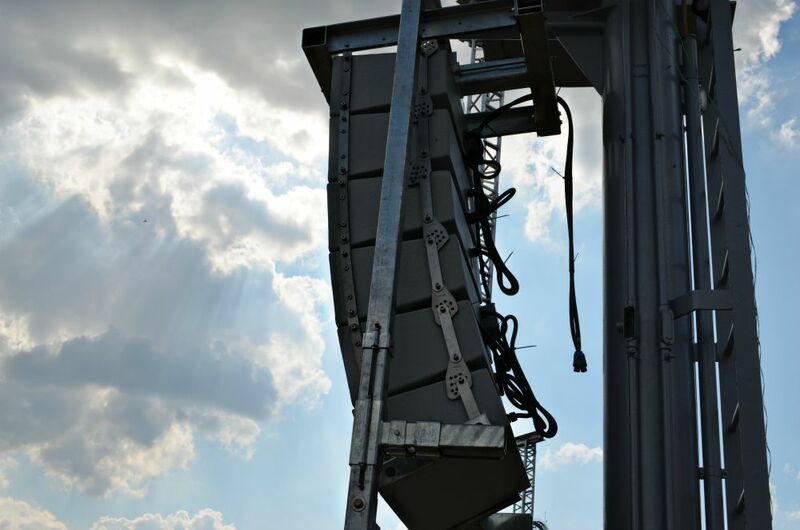 Both line arrays have tilt adjustment within the gimbal frame, with 3-axes adjustable anchoring at the bottom of the line array so it won’t ever sway in the wind. Each gimbal frame has adjustable pan control. 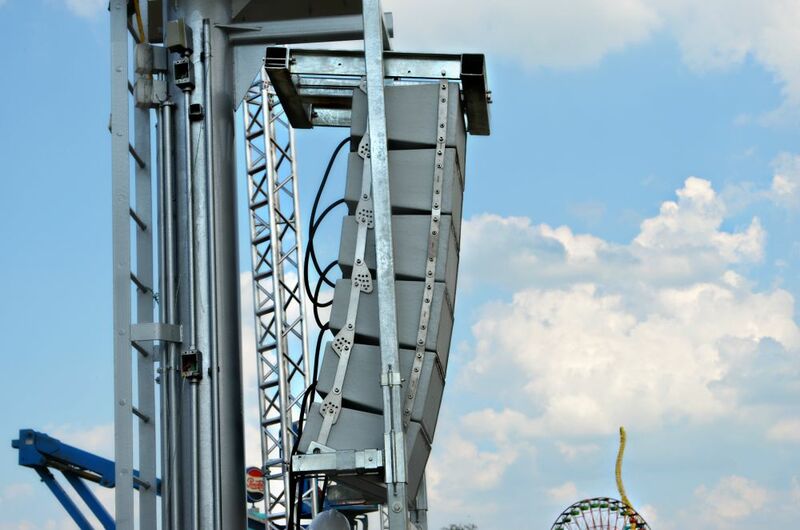 Adjustable pan and tilt control for this weatherized line array frame at Cedar Point. Orange and red roller coaster track behind the line array frame – looks like fun! 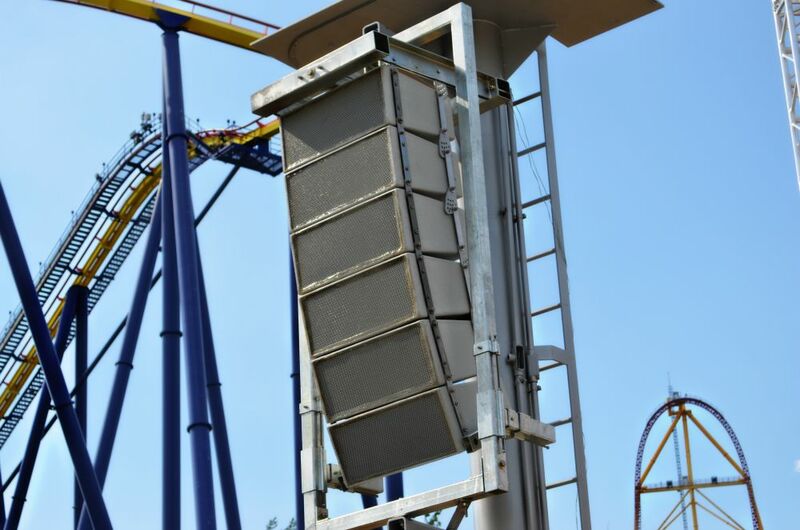 Polar Focus weatherized frame for QSC WL2102-wx at Cedar Point Amusement Park on the shores of Lake Erie – the Roller Coaster Capital of the World. The plate seen on top of the frame is for pyrotechnics. 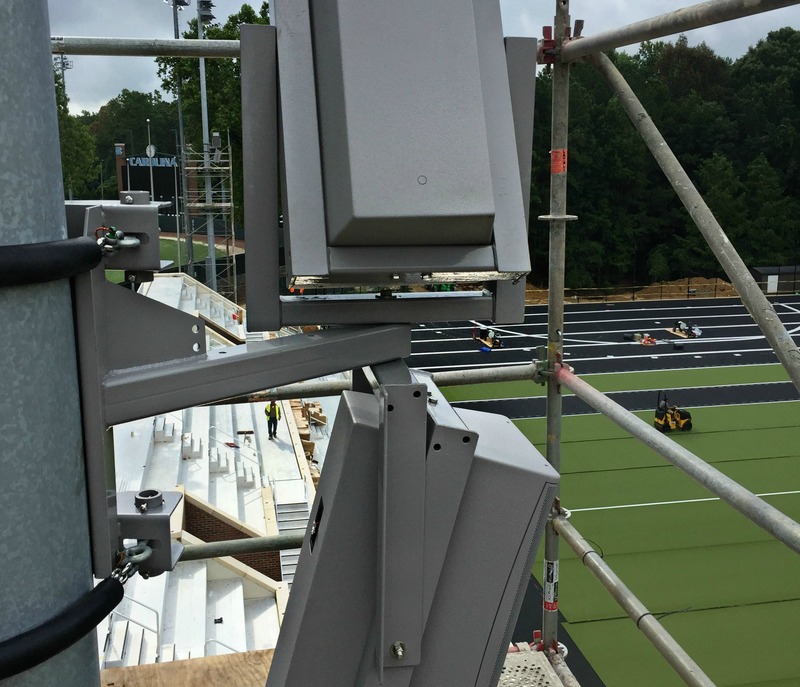 All array hardware provided by Polar Focus was galvanized for corrosion resistance. 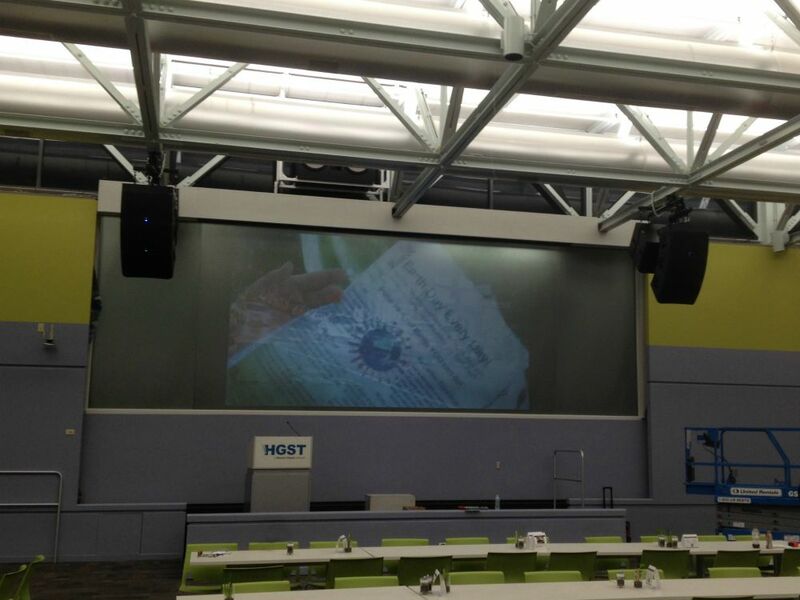 This system skillfully installed by Eric Choucron and Chris Evans at Washington Professional Systems. Photos courtesy of Washington Pro. Polar Focus reduces labor cost and variability by providing rigging systems which are pre-assembled to the maximum extent possible. Video | June 23, 2015 March 29, 2016 | Polar Focus, Inc.
We’d like to share an excellent video from Infocomm 2015, showing off our Zbeam Stem product. 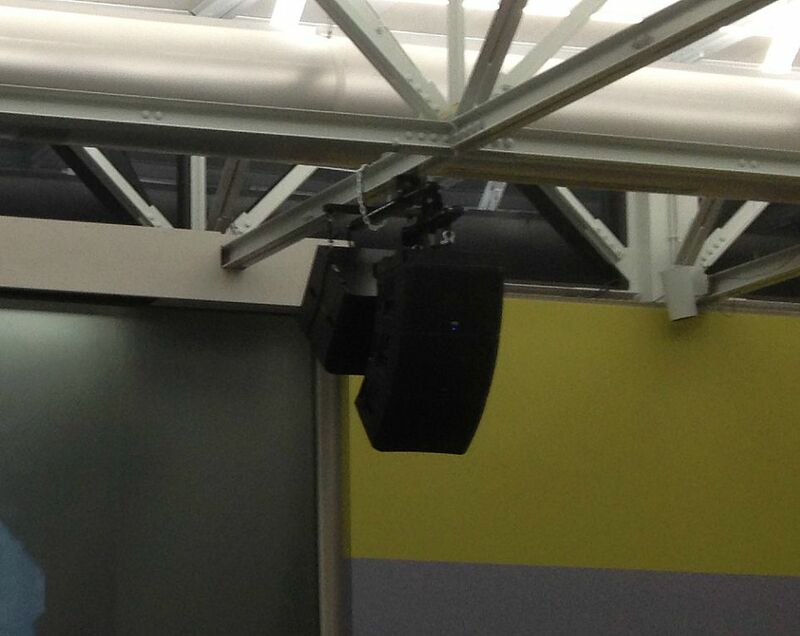 The hollow characteristic of the Stem component allows the speaker signal wire to be chased through the Stem body – allowing the speaker junction box and the upper arm of the Zbeam® Universal Speaker Rigging Beam to hang neatly inside the ceiling allowing for our cleanest Zbeam installation to date. 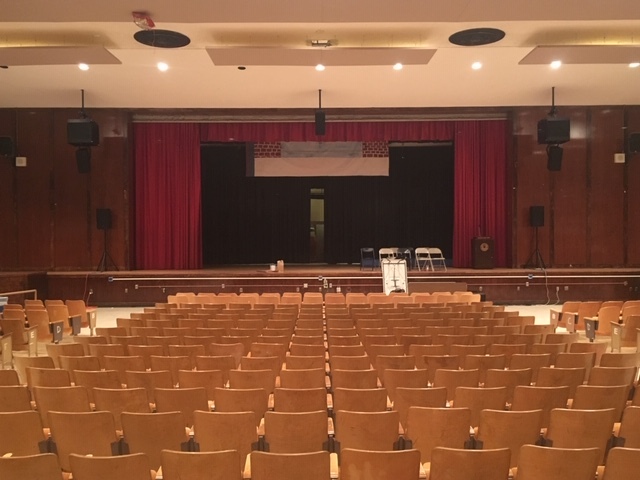 If this or any of our products can help with your flown speaker installation, call our Audio Rigging Consultants at (413) 586-4444.